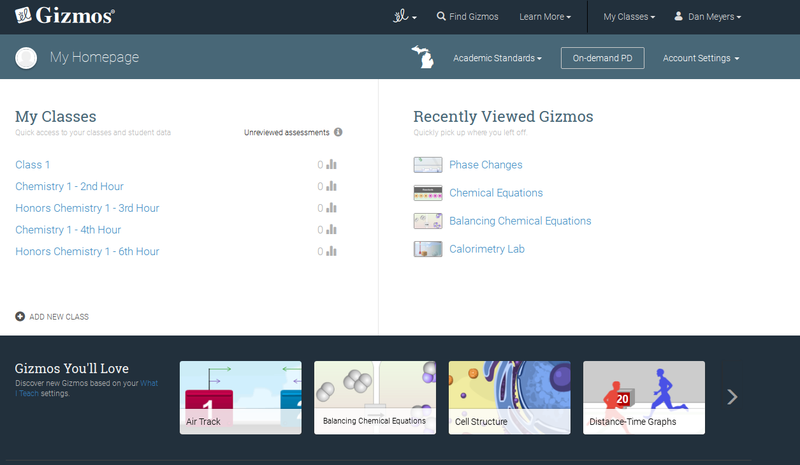 According to the Gizmos website, there are over 400 math and science Gizmos (simulations) available for grades K-12 that “gives everyone something to graph, measure, and compare. Even predict and prove." They promote inquiry and understanding. “Gizmos support the latest educational standards and assessments. (The simulations) run on PCs, Macs, Chromebooks, iPads, and Android devices.” This alone makes me more excited than I am with PhET activities, especially with a Chromebook cart in my room. Some PhET activities are still Java based apps which do not run on Chrome OS. I discovered this last spring when a PhET lesson plan failed. Gizmos also work great for blended learning, whole group, and 1:1 instruction. A free 30-day trial is available. You can also pay for a subscription. The price is negogiated based upon the number of students and teachers using the service. Check with your district/building technology department to see if there are funds available for you to join. 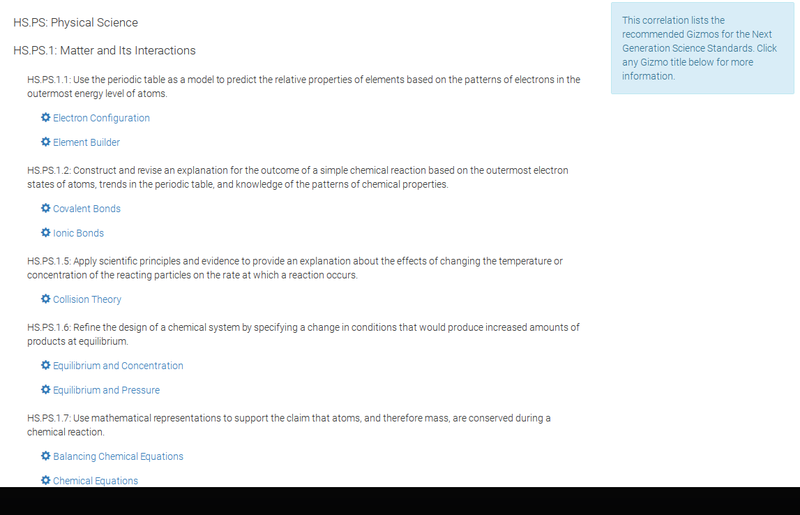 Below you will find some screenshots for locating specific Gizmos based on NGSS standards. 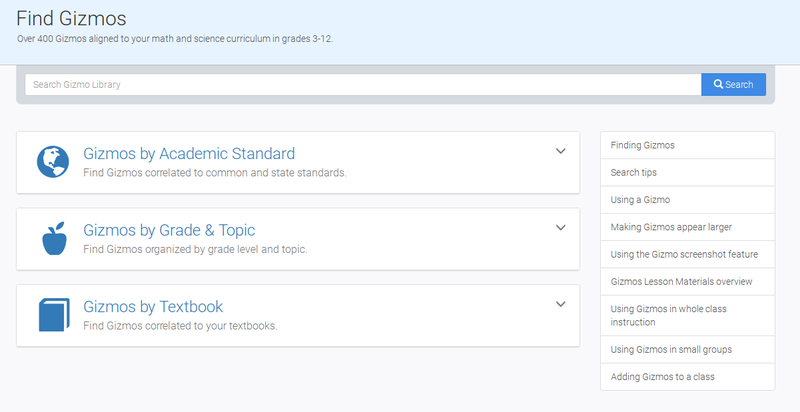 You can also find Gizmos based on state standards, grade level content, or textbook. You can build your own homepage. This is my homepage for my second hour class. 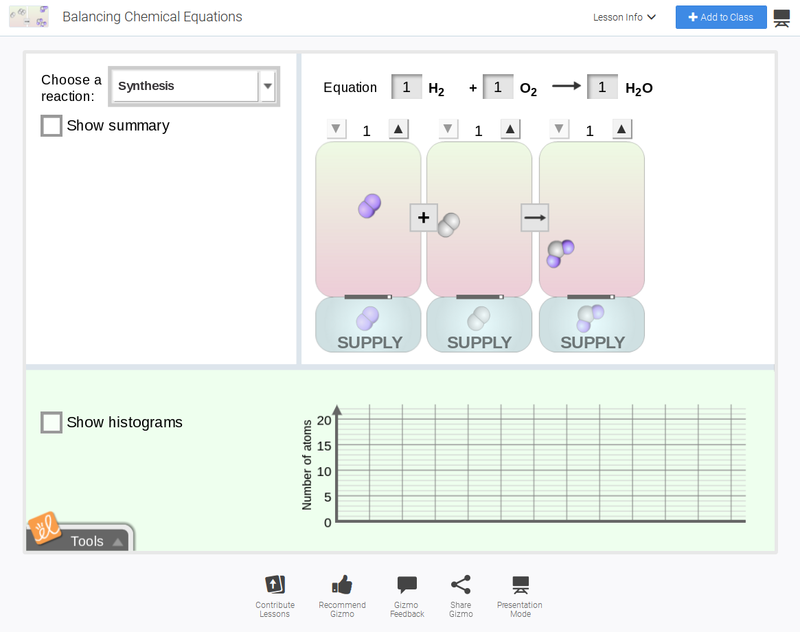 Lastly, here's a screenshot of what the Balancing Chemical Equations Gizmos looks like. I wanted to show the Balancing Chemical Equations Gizmos because after Thanksgiving I will be launching the Chemical Reactions unit within my regular and Honors Chemistry 1 classes. Gizmos provides a student exploration sheet, exploration answer key, teacher guide, and vocabulary sheet. There are also a set of multiple choice formative assessment questions that you can assign students at any point during a lesson. Thanks to the quality of the Gizmos, I will be completely revamping my reactions unit. Depending on how it goes, I might be blogging about it in December and providing resources that I used. Editor's Note - The author published a blog post about Gizmos on 12/20/16.